Been browsing this thread, interested in the Ghost MV1, the plenty, or the Enano. My favorite vape RN is my mighty. Hit for hit the Ghost seems cool but is it finicky? consistent clouds every time? Plenty is attractive because its powerful and im sure theres decent flavor but Enano is really what ive been eyeballing except I want something strong enough to rip tasty big clouds. Thoughts? If you don’t need portability, then you don’t need to accept limitations of portables. The Enano is terrific. Especially w the Gong bowl and a rig. Even better w a carb adapter. Nano will rip. I tend to think of the EVO and FP as stronger rippers, but in fact the nano can hold its own. Key is to let it warm up for 10-15 minutes. But, you can leave that sucker run 24 x 7. Another key w nano is it can run effectively w very small loads if you want. Just load .05 g, hit it, stir, hit it, and reload. Now, I do love both my Mighty and my MV1. Mighty is kind of a no brainer while it may take a bit more time to master and be comfy w the MV1, but both are terrific. I love a Ghost. Love their operation, their people, their CS and their product. But if I could only have one, I would probably go Mighty personally, just because it is so easy to usep. the eNano can be a beast too. It has blasted me to the moon before! I LOVE my eNano it looks good and it's so damn simple yet versatile. Hit it direct with a stem, put the gong adapter on a water pipe and it's crazy good. I also love attaching a whip to the adapter and using it like a hookah. ABSOLUTELY NOTHING "CHEAP" ABOUT IT ! $240, ISN'T "CHEAP" IMO ! SPOT ON ! LOVE MY NANO ! Everytime I go back to it (yes, ADD, get Bored Quick), I ask myself "Where has this been?" ! ohhh yes. Can't leave her out. Definitely want to add this one to the collection one dsy. Seems to be priced really well for what you get. I'll continue to wait till I can afford some exotic wood. Picked up an E-nano on Black Friday with glass screen stem and WPA. Struggled the first 2 nights using it through a 12" water pipe, disappointing performance and light hits. Then tried using it directly with long stem, much better performance and hits. Then tried with 2 J-Hooks of different sizes and settled on the larger GRAVA one. It also became apparent that this is truly a one-hitter, no matter how much you load, the flavor is gone after the 1st big hit. So now I load about 0.025 and take 1 super-long draw, and then dump and reload. If the unit is properly warmed up, you can start drawing 3-5 seconds after you put heater on stem, I would argue that this is one the fastest first-draw vaporizers out there, and this first draw is extremely flavorful and potent. All subsequent draws however are weak and flavorless IMO..
My first desktop vape is finally home. 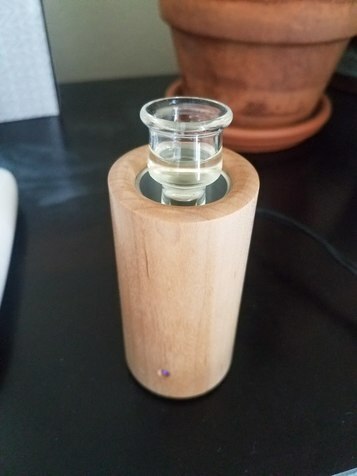 Maple unit coming with an aromatherapy attachment and the 8" glass stem. I have been trying it out over the last four days and I'm pretty taken back on how well it performs. Vapor is smooth and cool w/ bigger clouds than normal although I'm used to a Starry. I started at 5.5 and ended up on 7 at the end. Although my turn dial only goes up to 9.5 I spoke to Nadia from epicvape customer service (they are awesome)and she says this is a manufacturing issue and they're going to be sending me another one of them out. Aside from that this unit has a easy learning curve and really tends to my microdosing habits. How does the flavor and clouds compare to that of a MV1? I might grab thing and add a burl wood desktop holder. Can you leave it on and then get a big flavor cloud on the first hit? I don't own a MV1 but the clouds were good enough for me. Plenty good considering 6.5 power on the dial. We shall see if anyone chimes in on the MV1/Enano experience.